ARGOS can be used to make spacewalkers feel weightless. NASA began a mock asteroid mission this week in Houston to test out technologies that would allow humans to explore space rocks on future missions. The 10-day simulation is part of NASA's Research and Technology Studies program, known as RATS, which has been held every year since 1998. It usually occurs in remote desert locations, often earning it the nickname Desert RATS. But RATS 2012 is being held at the Johnson Space Center (JSC), which houses tools and simulators that would be difficult to transfer to the field, NASA officials said. The crewmembers will test out NASA's prototype for its next generation of Space Exploration Vehicles, or SEVs, on a mock mission to the asteroid Itokawa. In an Aug. 21 blog post for NASA, RATS crewmember Trevor Graff, a planetary geologist, explained that the vehicle sits in front of a large screen displaying the simulated asteroid. The virtual rock draws on data from Japan's Hayabusa mission to Itokawa and "looks and moves just like the real thing." "This extremely realistic simulation allows us to fly around, approach, and anchor to the asteroid, all while monitoring our flight controls, propellant usage and many other factors," Graff wrote. "Once we approach or anchor to the asteroid, one or more of us will perform a simulated spacewalk, also known as an EVA (Extra-Vehicular Activity)." The 2012 RATS team prepares for mission start in JSC's Building 9, with the prototype second-generation space exploration vehicle on the left and spectators in the overhead "catwalk." The crew can carry out a virtual spacewalk in two ways. Either they can put on special glasses in JSC's virtual reality lab, which provides an "immersive environment" with real time graphics and motion simulators, NASA officials said. 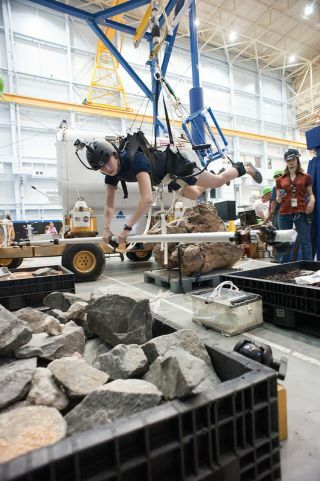 Or the crewmembers can get strapped into NASA's Active Response Gravity Offload System (ARGOS), which uses a crane to simulate the weightlessness astronauts would feel while exploring an asteroid's surface. The program also seeks to answer some practical questions about putting humans on a near-Earth asteroid, such as how astronauts would live in the SEV. "Once we were done with our flying tasks, we settled in for our evening tasks. That involved making a freeze dried dinner, setting up our cycle and exercising, and filling out a bunch of data sheets," crewmember David Coan, an engineer with United Space Alliance, wrote in another NASA blog post after the first day of the program. "Exercising in the confined quarters was challenging, and we mostly stuck with using the cycle. We finished the night by configuring our bunks for sleeping, and shutting things down for the night."